We are a small local hands on management firm that will personally check you in and welcome you to our home ensuring all guests will have a better experience. Directly on the beach with no boardwalk, this two-story 3BR/2.5BA house with elegant upgrades, including a striking kitchen, seamless indoor/outdoor living space with floor-to-ceiling glass doors, and a deluxe master suite. Walk steps from the private deck across the beach to enjoy the Pacific waters. What makes this unique to Sunset Beach is you are renting a private, detached house, not sharing part of a house like most other beach front rentals. Enjoy views from the open living area, plus a patio that spans the width of the house, great for entertaining whilst watching a magnificent sunset or the moon shimmering over the ocean. During summer months schools of dolphin can be seen leaping out of the sparkling Pacific on their daily swim. On a clear day you can see Catalina Island which is just a 30 minute boat ride away. There is a huge deck that extends to the sand. The home features include two distinct and separate living areas, one with views and the second as a media room. The home is well appointed and beautifully decorated. The master suite on the second floor features floor to ceiling glass windows with a private balcony, an ensuite ocean view bathroom with an oversized tub. After taking in the ocean air relax on a comfy queen bed in the second bedroom. The third bedroom is ideal for kids, furnished with a twin bed and twin trundle. These bedrooms share direct access to a second bath equipped with a huge luxury walk-in shower. A half bath is next to the main entry. The upstairs den features two comfy sofas (one converts to a sleeper) and a convenient wet bar. Peruse a fantastic selection of books, then relax for the evening and watch a movie on the flat screen TV. This house has all the amenities needed to enjoy your vacation time at the beach. Step onto the spacious deck and experience the timeless allure of the tides. Lounge on two Adirondack chairs or serve festive vacation meals alfresco at the 4-seat patio table. Follow the sandy path directly to the Pacific to splash in the surf. Enjoy the fresh coastal air on the master balcony; sip morning coffee and take in the lovely views. This beachfront getaway boasts an unbeatable location in Surf City USA, with prime eateries and shops within walking distance. This is a non-smoking property, which includes outside on the decks. Open fires of any kind (including in fire pits) are strictly prohibited by the fire code. 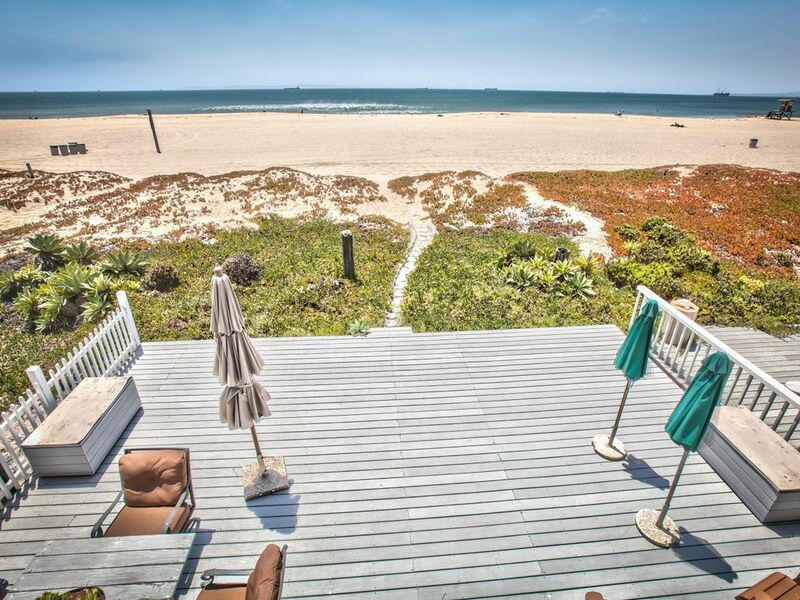 Keywords: California, Sunset Beach, Beach house, Ocean front, 2 story, spectacular views, 3 bedrooms, 2.5 baths, patio, deck, and more! The owner purchased the property around 20 years ago and remodeled the property 8 years ago. This gorgeous beach front home was designed to be a luxurious, comfortable summer retreat to maximize the views and location. 35 Minutes drive from LAX and 15 minutes from John Wayne Airport or Long Beach International. Close to the restaurants and shopping areas of Pacific City, Fashion Island, Newport Beach, South Coast Plaza, Naples, Belmont Shore and Bella Terra outdoor mall, Huntington Beach. The amazing Aquarium of the Pacific or Disneyland is just 20 minutes drive. The beautiful views, location to surrounding activities available in Orange County and more! We did enjoy this house. Nice location. Great view. Opening the sliding doors in the Master was awesome. Unfortunately, it seems like there are quite a few unfinished projects. The guest shower is not useable. Water pressure is way too high. It hurt. Oven was broken. Toilet paper holder fell off. Beach toys were not adequate and garage was not usable. There are also little signs everywhere saying what u can and can’t do. We would stay again but it would be great if they fixed things. Large beautiful home with a gorgeous view! This property was absolutely gorgeous - everything about it was perfect. From the home itself to amount of space that it comes with. I would recommend this home to anyone looking to get away with your family and want to make sure that everyone has their own space. This house is just incredible with ocean views through out, waking up to the ocean was just magnificent. Kids were able to go out the back to play in the sand the house set up is great, modern and has everything you need. Loved everything about this house! The heat was not working when we arrived and it did get chilly as we were there in December but management did all they could to rectify it ASAP and were great to work with. This house is a true gem. It is right on the sand of Sunset Beach and offers a completly uninterupted view of the beautiful pacific ocean. The house itself was completly spotless. This must be the cleanest rental I have had the pleasure to stay with. The master bedroom has the most incredible views, and waking up to see dolphins and surfers will put a smile on anyones face. The house was large and offer two distinct sleeping areas (master and then the back bedrooms with a shared jack and jill bath). This is great for kids or dual families. The kitchen was in great shape and the washer and dryer was also updated and worked well. The bathrooms were very clean and modern. I have stayed in a lot of properties and this is one of the better ones and a good deal (at least in October when I stayed). The management company was very proffesisional and always available (although I had no issues to report). They give you a code for the door, so "check-in" was very easy. If I had to list a few items to look out for, here they are (although I am really reaching to come up with these two items); there is no TV in the main level living room that has the ocean views. The only TV's are in the master bedroom and the upstairs den which is in the back of the house with no view at all (kinda dark but comfy couch). I would have a TV in the lower level also. The house did not have basics like salt and pepper, olive oil etc in the kichen so make sure you bring that sort of thing. Otherwise no "real" complaints at all. This house has my highest recommendation. Enjoy. We loved this house! We stayed for an extended weekend with our four children. Our older two (7 and 9) loved the children's books owner has in loft area. The house was very accommodating to our younger two (10 mths and 3) as well. House has a very practical floor plan. Really cute decor. The location couldn't have been any better. The beach is literally your back yard. Only reason I didn't give five stars for cleaniliness and furniture was because master bedroom bedding/pillows was stained. But even though it was past 10pm (we arrived at the home late) the property management company employee drove to the house with brand new bedding and pillows!! The entire stay was so relaxing. We can't wait to book again!